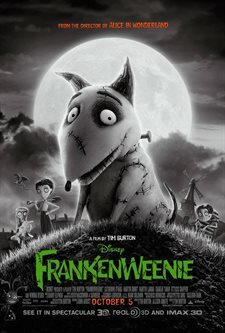 Download Frankenweenie in Digital HD from the iTunes store. 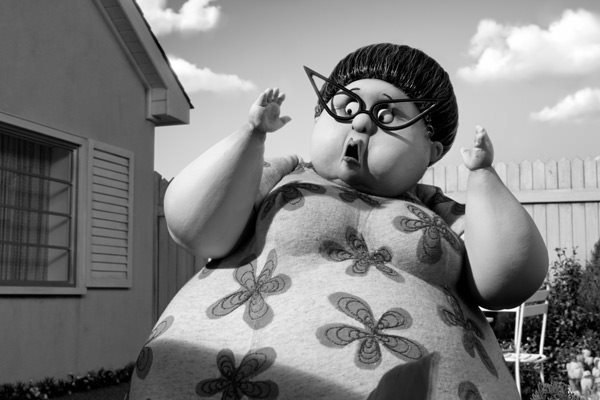 Frankenweenie images are © Walt Disney Pictures. All Rights Reserved. With Halloween quickly approaching horror flicks take center stage at the movie theater. But, most fright films this time of the year are not for kids. Disney's Frankenweenie however pulls out all the stops and bolts into movie houses around the nation providing some family fun and its rated PG for most everyone. Direct from the imaginative files of Tim Burton who gave us enjoyable films Alice in Wonderland, The Nightmare Before Christmas and Corpse Bride, this little jewel entertains big time. 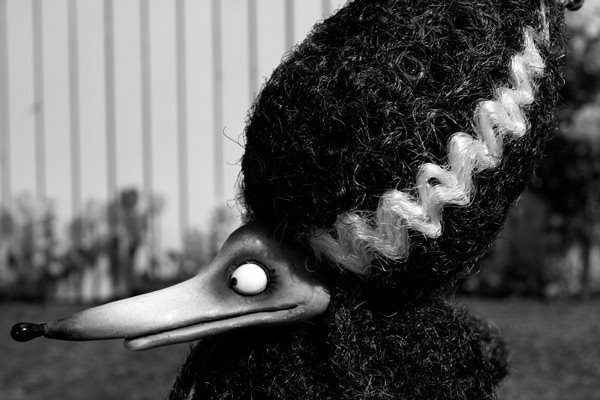 Using his creative technique of stop-motion animation and adding 3D to give it depth isn't enough for the creature master, this time his scary tale becomes even spookier in Black & White. Although Burton takes pages from Mary Shelley's horror book Frankenstein and some other beastly stories, he develops a more family friendly film. Here he creates his central characters being Victor Frankenstein (voiced by Charlie Tahan) a regular nice young boy and his lovable dog Sparky. The two are nearly inseparable and even at school the boy yearns for his best friend. His science teacher Mr. Rzykruski (voiced by Martin Landau) has high hopes for Victor who seems to be the most interested in the class. When they discuss the area's tendency for lightning, the two make a student teacher connection. Wanting to please his father (voiced by Martin Short) baseball has become another passion for Victor and Sparky chases balls around the yard for his master. One day at a baseball game Victor smashes a hit out of the park. Sparky seeing the ball go into the air he breaks his tether and goes after it crossing a highway in the process. With ball in mouth he starts to return and gets run over by a car. Lost without his able pet, Victor gets an idea from his science class that he can use to bring Sparky back to life. Taking him from his grave and hooking the dog up to a lightning driven contraption, he succeeds. When his feat gets discovered by his friend Edgar (voiced by Atticus Shaffer) things start going awry in Victor's little town of New Holland. Taking Mary Shelly's horror story to new depths, adding some comedy, interesting characters and a lot of heart, Burton shows a love between humans and their pets. I actually couldn't find anything scary in the film that would bother young children who are old enough to enjoy a Halloween night of unusual costumes. In a nutshell, if The Nightmare Before Christmas didn't bother the child, this one has a story that's a lot tamer. 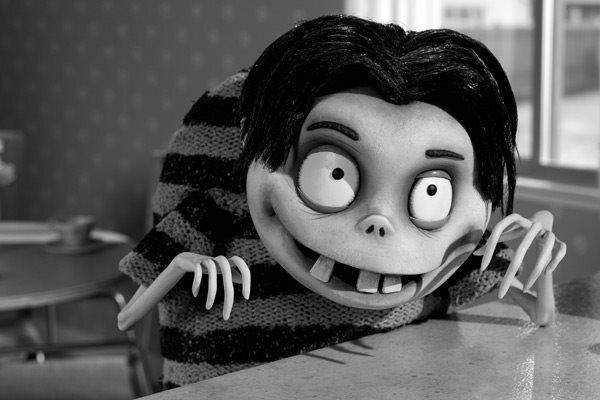 Please note however, Frankenweenie has been rated PG by the MPAA for thematic elements, scary images and action. I found that the use of black and white as the medium gives the film an older feel and after about ten minutes into the movie it wasn't a bother at all. Since the film plays to audiences of all ages, color would have taken the spookiness out of the storyline keeping most adults bored with the production. 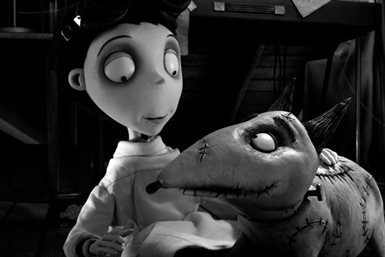 The 3D is not necessary in my estimation and although the depth of field does add some dimension to Frankenweenie, it's not enough to pay the additional price to see the movie. Frankenweenie images © Walt Disney Pictures. All Rights Reserved.